Share the post "Les Roches International Hotel Management School renews agreement with IFARHU"
Les Roches International School of Hotel Management, part of Laureate Hospitality Education (LHE), renewed the agreement with IFARHU, an educational institution of the government of Panama. The signing ceremony between LHE and IFARHU took place in Glion, Switzerland early June 2011. 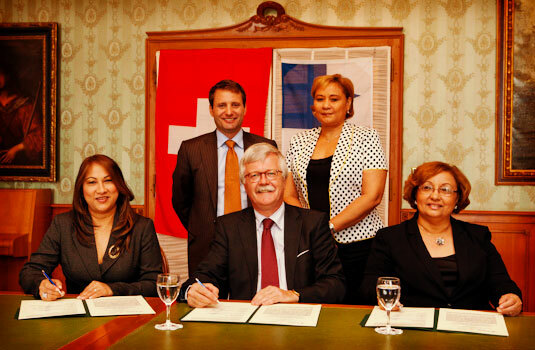 IFARHU, the ‘Instituto para la Formacion y Aprovechamiento de Recursos Humanos’ of Panama, was represented by its director general Sonia de Luzcando, who especially came to Switzerland for the signing ceremony and to visit the Swiss LHE properties: Glion Institute of Higher Education and Les Roches International School of Hotel Management. She was accompanied by IFARHU Secretary General Eusebia Moran and Aixa Maria Diaz Granados De Quintero, Secretary General of the ministry of education of the Panamanian government. The purpose of the five year contract between LHE and IFARHU is to continue the educational cooperation in order to benefit Panamanian students and professionals interested in studying hospitality, hotels, tourism and international cuisine at the certificate, bachelors, masters, post-graduate, graduate and seminar levels at participating LHE institutions in Switzerland and Spain. The LHE schools are considered as the top hospitality management schools in the world. Under the agreement, IFARHU will promote the LHE schools through their student loan program. Both parties will study the possibility for additional scholarship programs in the future. Sitting: Sonia de Luzcando, Arie A. J. van der Spek, Eusebia Moran. Standing: Michael Huckaby, Aixa Maria Diaz Granados De Quintero.